Luxuriously equipped apartment Vuk is located at one of the oldest streets of Belgrade, Vuka Karadzica street in the pedestrian zone next to the Gallery ULUS. 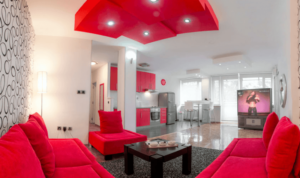 This brighta, modern and luxury apartment is located close to all major attractions of Belgrade. On the other hand it gives peace and calmness to its guests. Aapartment Vuk has modern living room with dining area and separate bedroom with double bed, fully equipped kitchen and bathroom. Apartment can accommodate up to 4 people. 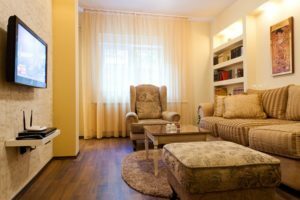 The apartment is equipped with TV, iron, hair dryer, air conditioning, bedding, towels… In addition you can find in apartment: cable TV, internet connection and WIFI. If you travel by car, you can park your car in the garage at the Obilicev venac. Apartment gives to guests luxury ambiance that ensures privacy.